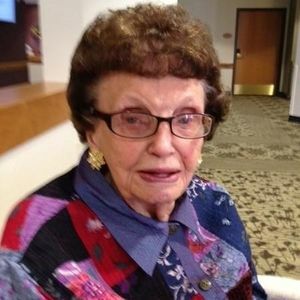 Selma "Sally" Carlson, 92, took the hand of Jesus and joined loved ones in heaven on November 12, 2012 at the Pioneer Care Center, Fergus Falls, MN surrounded by her family. Funeral services will be held on Friday, November 16 at 10:30 AM at Galchutt Lutheran Church, Galchutt, ND with Rev. Ken Kirchenwitz officiating. Visitation will be held on Thursday at the Willow Creek Chapel (920 3rd Avenue North) Wahpeton, ND from 5:00-7:00 P.M. with a 7:00 P.M. prayer service. There will also be visitation at the church Friday morning from 9:30-10:30 A.M. Interment will be at St. John's Cemetery, rural Galchutt, ND. Selma (Sally) Matelda Carlson was born on March 26, 1920 in Garborg Township near Wyndmere, ND to Christ and Lena (Mitskog) Odegard. She attended school in Nansen Township and later moved to Galchutt, ND and attended school there. She graduated from Abercrombie High School. After graduation, Sally attended Mayville State College, Mayville, ND, Interstate Business College, Fargo, ND and later the New York Hairdressing Academy, Fargo, ND. On December 5, 1941 she was united in marriage to Alvin (Ebb) Carlson in the Galchutt Lutheran Church (they were the first couple to be married in this church) They made their home in Galchutt and raised three sons; Keith, Kent and John. Sally was an active member of the Galchutt Lutheran Church where she taught Sunday School and was active in ladies aide. She was a den mother for Boy Scouts in Galchutt, a cook at the Galchutt School and worked for Minn-Dak sugar at the Galchutt piler. In 1995 she and her husband moved to Wahpeton, where she enjoyed being with her family and friends and met every day for coffee at the Town Centre Square. In August 2009 Sally moved to Battle Lake, MN in November of 2009 to the Park Garden Assisted Living and in 2010 to the Pioneer retirement, all of Fergus Falls, MN. Sally loved being with people and made donuts in which she treated her many friends and family. She also loved collecting dolls. She was a volunteer at the nursing homes and was a "steady" visitor to all at the home. She was always there to provide transportation to those who couldn't drive; taking them to the doctor or for groceries. Sally leaves her family with such wonderful teachings and memories; and will be dearly missed. She is survived by her son, John (Peggy) Battle Lake, MN and her daughter-in-law, Joan Carlson, Fargo, ND, five grandchildren: Michelle (Scott) Gietzen, Davenport, ND, Jamie (Korey) Gunderson, Colfax, ND, Erick (Julie) Carlson, Breckenridge, MN; Dawn (Brian) Kieselbach, Barnesville, MN and Heather (Jeff) Allickson, Fargo, ND; eight great- grandchildren, Luke and Mya Gietzen, Taylor and Rylan Allickson, Nevaeh and Arianna Gunderson and Odin and Dane Carlson. She was preceded in death by her parents, her husband "Ebb" in 2001, two sons, Kent and Keith, a brother Teddy and her sisters, Charlotte Stende and Elisabeth Hendrickson. John and Peggy and Family, Just a note to say we are thinking of you in this difficult time and extend our sympathy. May Sallys memory be a treasure to your family and bring a smile to your face when you think of her. Sally, Ida and my Mother, Oline Aird, shopped together for a number of years with Sally as the designated driver. When Mom moved to St Catherine's,Sally and Ida brought her lunch every week. I know this added quality to her life with something to look forward to. She was very special and a joy to be around. Your family was like a second family to me while growing up and I have so many memories that I will keep in my heart forever, one of those being Grandma Sally. I'm very sorry for your loss. Thoughts are with your family as you say goodbye to a great lady. John, Peggy and families - Sending my thoughts and prayers during this time of sorrow. She will always be with you in your heart. Although I never had the pleasure of meeting Grandma Sally, I know that she was a wonderful woman who was so loved by her family. Peace and comfort to all!